Art Therapy is a fairly common subject that people are very familiar with. 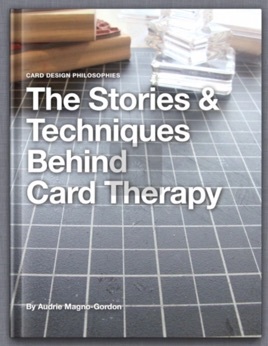 However, the idea of making cards as therapy may be foreign to you. Take a tour into the creative mind of a passionate card designer as she explores the stories and techniques that make her projects a reality, and a form of creative therapy. There are over 40 Projects in this first volume 1. Watch for Volume 2 which will explore mini-albums and card-size gifts soon!